My kids went back to school on this week after their long summer break. Thankfully they were both excited about starting school and couldn't wait to get back and see all their friends again. After the first day the excitement hadn't diminished as Maya now has her own MacBook in the classroom and Ben is now able to buy his own lunch and have lunch with the older kids. For me, back to school means planning healthy lunches and snacks for the kids. I do let them buy the school lunch a couple of days a week, as a treat, but I still like to have a little control over what they eat. In Singapore, because of the heat and humidity, preparing healthy snacks can be a little challenging. But an insulated lunch box with ice packs is an essential investment and will go a long way to ensuring that the food stays in a relatively appetising condition. Cutting up fruit is not popular, apart from watermelon, as fruit such as apple and pear go brown when sliced. Bananas always get squashed, although half a kiwi fruit usually gets eaten. In the UK over summer we ate plenty if the very popular snack they call flapjacks. These delicious muesli-type bars made with oats, butter and golden syrup can be chewy or crunchy depending on your preference, and are easy enough for kids to make. They are also filling and although pretty sweet, are a good source of fiber. 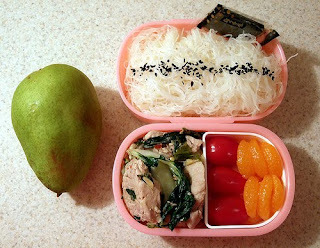 If you do want some inspiration for school lunches, check out JustBento.com. I usually make a humble sandwich for my kids, but at this website you can see how a little imagination can make kids' lunches so much more interesting. The Japanese Bento-style lunch is so nutritious, colourful and fun-what kid could resist! This post especially has inspired me to try to give the kids a little more variety.